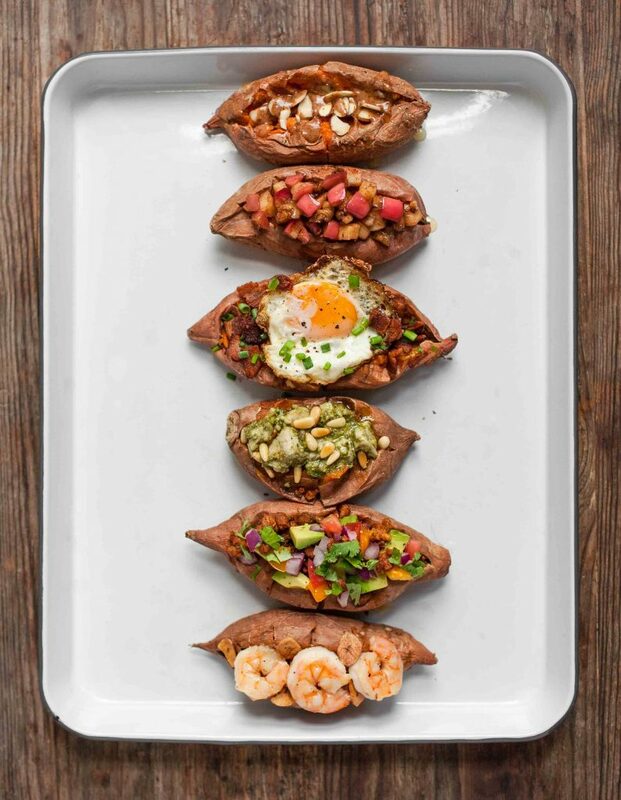 Whether you like them sweet or savory, there’s always a stuffed sweet potato option for everyone! Try one of each for dinner to kick things up, or try these for your next meal prep. To make the roasted sweet potatoes, preheat the oven to 400°F and line a baking sheet with foil. Pierce each sweet potato several times with a fork and arrange the sweet potatoes on the baking sheet. Roast for about 45 minutes, or until the sweet potatoes are tender when squeezed with an oven mitt on or when pierced with a fork. Let cool for a few minutes, then cut partway through the potato lengthwise and then crosswise to open it up. Mash the insides a little with a fork if you like. Top as desired (see instructions below) and serve hot. To make a breakfast sweet potato, cook the bacon pieces in a small cast-iron skillet over medium heat until crisp, and then transfer to a plate lined with paper towels to drain. Raise the heat to medium high. Carefully crack the egg into the bacon grease and cook for 1-2 minutes, carefully spooning some of the fat onto the top of the whites if desired, until the edges of the whites are browned and crisp and the yolk is cooked to your liking. Transfer the egg to the paper towel-lined plate. Sprinkle the bacon onto a roasted sweet potato, put the egg on top, and sprinkle with chives, salt, and pepper. To make a pesto chicken sweet potato, begin by toasting the pine nuts in a dry skillet over medium heat, stirring often, until golden brown. Transfer the nuts to a plate to cool. Mix the chicken, pesto, and cream (if using) in a small bowl. Stuff a roasted sweet potato with the pesto chicken and top with pine nuts. Season to taste with salt and pepper. To make a chorizo avocado sweet potato, heat the oil in a skillet over medium-high heat. When the pan is hot, add the chorizo and cook, stirring occasionally and breaking up the meat with a spatula, until browned and cooked through. Top a roasted sweet potato with the chorizo, tomato, red onion, cilantro, avocado, and a squeeze of lime. Season with salt and pepper to taste.